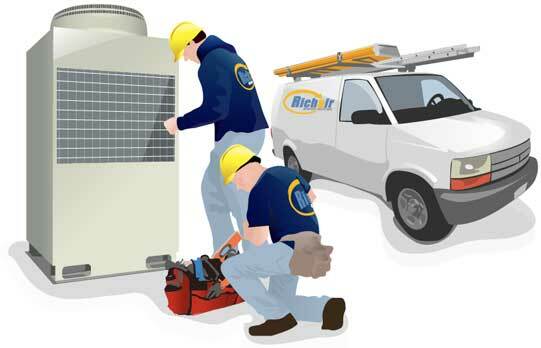 Richair Comfort Solutions offers professional ductless mini split service and repair, chemical-pressure cleaning for residential and light commercial customers in Queens, Brooklyn, Bronx, Manhattan, as well as some areas in Bergen and Hudson Counties, New Jersey. Our service and repair team works hard to provide our clients with unmatched quality of service. Any HVAC system consist of components that heat, cool, filter, and dehumidify the air. These include air handling units (blowers) and outdoor (condenser) units. The lifespan, efficiency and cost-effectiveness of any of these systems hinges on regular and effective service and periodic cleaning. Without a regular attention, systems won’t operate like they should. Why should you pick us? We are Different! Yes, that’s the label Mitsubishi Electric attaches to their products, and our service ethic is just the same. This is why our company continues to be highly recommended. Our view is that a service is not only fixing a broken system, but also making sure the we do our best to prolong its life and maximize efficiency. We have lost count of how many times we open a malfunctioning unit and find how poorly it was managed and installed in the first place. Our goal is to set things right, once and for all. Wait, what? No, we’re not crazy (well, maybe a little). We’re just so absolutely certain you’ll love our work that we don’t mind offering you a complete guarantee. We have nothing to hide, and lots to show you! VIP Treatment In the HVAC Industry? We Think So! More than 20 years of experience in ductless mini split service and repair has taught us that the best kind service starts with the customer. We feel it is very important to create a comfortable atmosphere while we are working for you. From the very beginning we will deal with you in a professional, courteous and individualized manner. It seems many contractors have gotten a reputation for being difficult and alienating to their customers. We are changing this approach!